The resort is a starting point for walking, hiking as well as for going on excursions. Murren with its summit Schilthorn offers its guests 53 km of ski and snowboard runs, toboggan runs etc. But, besides the perfect conditions for skiing and relaxing both in summer and in winter, Murren has its own the secret of popularity. Let’s try to unveil the secret together with us! Michelle Wyss – Head of Products of Schilthorn Cableway Ltd has kindly agreed to share with us the most interesting facts about Murren. SkiT. : Despite the fact that Murren is smaller than closely-spaced Wengen and Grindelwald, it has rich history and «own face»! Our tourists and winter holidays lovers would like to know a little about resort’s history and about the people, who created this history. M.W. : Murren – is an Alpine village with 300-years history. 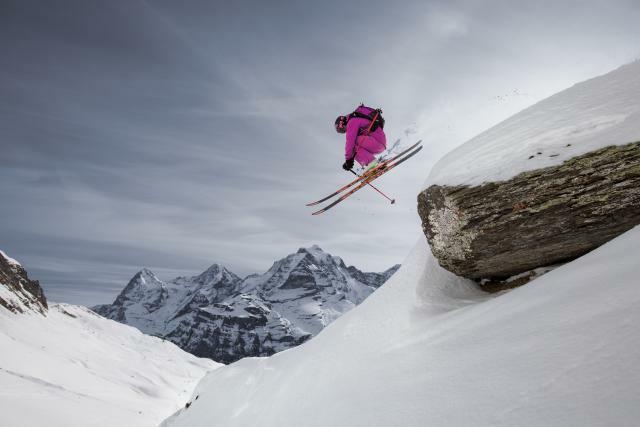 The winter sports have been an important part of Murren’s history since the first British winter tourists arrived in 1911. The Kandahar Ski Club was established in 1924 in Murren by Sir Arnold Lunn and 8 other British skiers. In 1931 the first World Ski Cup was organized by the British pioneers. And today you can meet lots of British tourists on the slopes of the resort. SkiT. : Could you tell us about peculiarities and the main sights of the resort? It is confessedly that TITLIS mountain is a symbol of Engelberg, and Matterhorn and Mont Blanc, correspondingly, are brands of Zermatt and Chamonix. And what is a Murren symbol? M.W. : The Murren symbol is mount Schilthorn – Piz Gloria and the glorious view on the famous peaks Eiger, Mönch and Jungfrau. SkiT. : A number combination «007» occurs quite often in local names. Obviously, there is a reason. So, what is the secret? M.W. : I suppose most of us heard about the agent James Bond 007. That’s the entire secret! The fact is from October 1968 to May 1969 the Schilthorn was a pivotal filming location for the iconic James Bond movie «On Her Majesty’s Secret Service» (click here for more – https://skitours.com.ua/news/interaktivnoe-issledovanie-mira-bonda-007-video). The revolving restaurant served as arch-villain Blofeld’s headquarter and was called Piz Gloria has kept its name to the present day. SkiT. : What are the peculiarities of skiing at the resort, and when can your guests enjoy skiing? What about weather and snow cover size? M.W. : Skiing is possible from December until mid-end of April. If the conditions are good, some of our lifts are opened on several weekends in November. The Murren – Schilthorn area is the Bernese Oberlands highest-altitude winter sports are with guaranteed snow. SkiT. : It’s unbelievable, but we heard that Murren is a motherland of skiing sport (however, as every resort asserts this right). Besides, the first official World Championship was held exactly in Murren! What famous sport and social events are held at the resort? Is it true that legendary Kandahar run was created in Murren? M.W. : The most famous winter event is the International Inferno race. 1850 intrepid skiers launch themselves down the mountain in the world’s most spectacular ski event. This certainly isn’t a race for the faint-hearted or the unfit. The course runs from the Schilthorn down to the valley, which, in good conditions, equals 14,9 gruelling kilometers to Lauterbrunnen. The race started in 1928 by a daredevil group of English skiing pioneers of the Kandahar Ski Club. This longest amateur ski race remains enduringly and overwhelmingly popular in the world. Besides, there is a chair-lift and a slope named Kandahar. SkiT. : And what can you tell about off-pistes skiing and facilities for snowboarders and freeriders? What can the resort offer for young and desperate people? M.W. : The Murren resort is not known for a crazy party scene, but it still attracts young people, freeriders, freeskiers and snowboarders. Accessible via cableway, the backcountry surrounding the Piz Gloria boasts several phenomenal freeride runs. In fact, those who know the Schilthorn rate it as something of an insider tip. Schilthorn Cableway maintains a long-term collaboration with the internationally known local freerider Sascha Schmid, with the aim of enhancing the destination’s exposure in freeriding circles. For freeskiers and snowboarders there is the SKYLINE SNOWPARK. Parallel to the ski piste are running two lines with beginner and advanced difficulty degrees, with a further expert line for the pros as and when snow-depths allow. Numerous kickers, rails etc guarantee spectacular jumps and adrenaline-packed action. Annual events such as the «Acrobag tour stop», the legendary «QParks tour» and further highlights guarantee exciting winter seasons. SkiT. : What are accommodation facilities at the resort? What hotels, residences and chalets are popular among tourists? M.W. : Murren has range of 3-star hotels and one 4-star. Holiday apartments / chalets are also available. Now we plan the building of a new hotel «THE MYRRHEN», the 4-star hotel apartment hotel with 76 apartments / 262 beds in 4 houses. SkiT. : What can the resort offer after skiing or instead of it? M.W. : Murren is a relaxing, charming alpine village. There is no fancy après-ski and parties all night long. That’s our guest really love about Murren. Non-skiers go for sledging, winter or snowshoe hiking, curling, ice skating. Or they can relax in wellness centers in the local sport center, visit spots like the Schilthorn or just stay on one of the numerous sun terraces enjoying tasty local food and the views. We can offer a various range of opportunities! SkiT. : What can Murren offer for families, except accommodation? What special skills can ski schools teach children and adults? M.W. : Murren is not a resort focused on offers for families and kids. But as it is a calm and relaxing place, it is very easy to stay there with kids and let them play around. A nice place to go is the Allmendhubel, where they find the children playground Flower Park, which is basically a summer offer, but partly also open in winter. Next to it is a small ski lift and easy slope, which is used by the ski school as well. Or families can go for the sledging safari, which also starts from there. SkiT. : What innovations can be expected from lift stations? M.W. : There are no nameable innovations regarding lift stations. Next year we will plan to set new artificial snow installations, to ensure even better snow conditions also in the lower areas. SkiT. : Having visited other resorts of Jungfrau region namely Grindelwald, Wengen and Interlaken, we saw amazing number of foreigners in town as well as on the slopes. What countries do your tourists usually come from? M.W. : It is basically comparable with Grindelwald, Wengen and Interlaken. SkiT. : Tell us, please, what is the best way of getting Murren from big cities? Is it true, that it’s impossible to get there by car? M.W. : Yes, you’ve correctly noticed! Murren is a car-free village and reachable by cable car from the valley station of Stechelberg. It takes 10 minutes. Stechelberg can be reached on good roads throughout the year, if travelling by car. Another option is to travel by public transport via Interlaken Ost. Interlaken is easily reached by train, either via Basel – Bern – Spiez or via Lucerne over the Brünig Pass. Change trains at Interlaken Ost for Lauterbrunnen, then take a postbus, which takes you directly to the valley station.